Gambling World is Proud to Present Intertops Casino! Offering gambling entertainment that is both fun and exciting is apparent from the moment you enter the casino lobby. 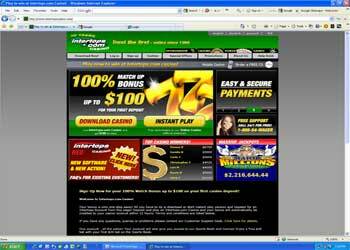 Intertops Casino offers a full download version as well as a flash version of their thrilling games. In fact the download suite of games actually has around 190 games, and the flash version has over 100 games total (although most games in the flash version are included in the download version) but with almost 200 to choose from you can be sure you will find some you will love to play. The betting limits on most slots and video poker start as low as 25 cents and some games offer maximums as high as $20 or $25. Tables games offering betting limits that start as low as 50 cents and on some games are as high as $500. In addition to all the slots and table games that most casinos offer, Intertops also has a full sportsbook available where you can bet on your favorite sports. And if you like poker, they also have a full poker room with tournaments and cash tables. For those visitors who need help or have questions, the customer support staff is very knowledgeable both with the casino games as well as the different payment methods and is available 24 hours a day 7 days a week. They can be reached by email or immediately by toll free phone number available directly on the website. And if you're looking for a signup bonus, new players qualify for a 100% matching bonus up to $100. Whether you play casino games, bet on sports, play the ponies or enjoy a good game of poker, Intertops has the excitement and gambling fun that you are craving. With this much to offer both new and seasoned players you owe it to yourself to try Intertops Casino out. Just simply download their software and create an account and within minutes you too can be listed among their recent winners.